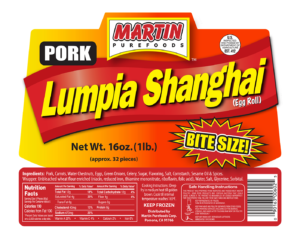 Home »Pork Lumpia Shanghai Bite Size 16 oz. »Pork Lumpia Shanghai Bite Size 16 oz. Pork Lumpia Shanghai Bite Size 16 oz. 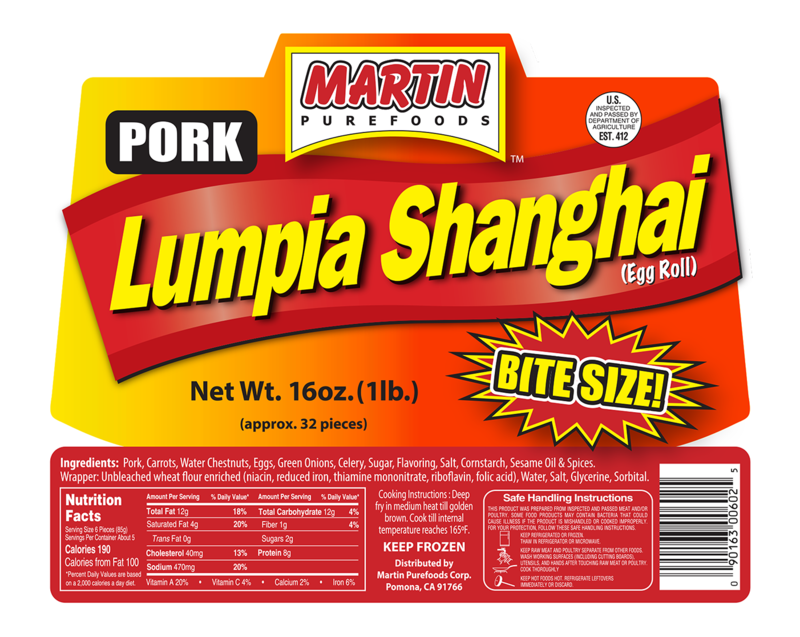 INGREDIENTS: Pork, Carrots, Water Chestnuts, Eggs, Green Onions, Celery, Sugar, Flavoring, Salt, Cornstarch, Sesame Oil & Spices. Wrapper: Unbleached wheat flour enriched (niacin, reduced iron, thiamine mononitrate, riboflavin, folic acid), Water, Salt, Glycerine, Sorbital. COOKING INSTRUCTIONS: Deep fry in medium heat till golden brown. Cook till internal temperature reaches 165ºF. ← Previous Previous post: Pork Lumpia Shanghai Bite Size 16 oz.